Anne from the executive office avoids a sad desk lunch by lunching at the Bank of America Winter Village Holiday Shops. As an inconsistent vegetarian, I was really happy to stumble upon new arrival Vegushi. Located on the Deck, in kiosk L4, Vegushi serves a variety of vegan rolls and salads, as well as hot miso soup. Though the salads and soup look delicious, the rolls are really where Vegushi shines. I was torn between the Bryant Park roll (avocado, pickles, and eggplant topped with sweet potato) and the Crunchy Sweet Dragon (avocado, cucumber, topped with sweet potato and fried onion). Both contain a heavenly avocado and sweet potato pairing, but the Dragon has fried onions. Decision made. 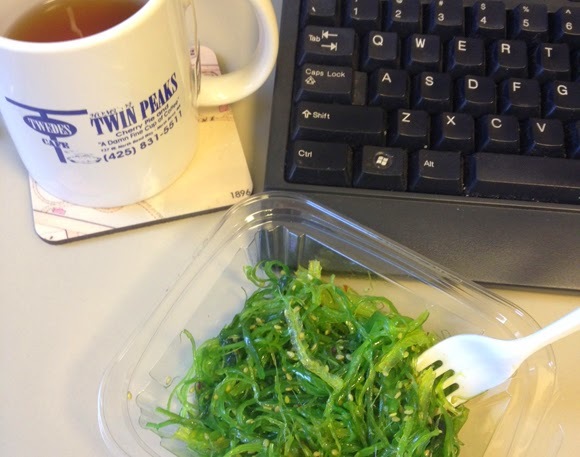 I also tried the seaweed salad -- a solid side if there ever was one. The only way I can make this lunch better is to not eat it at my desk in front of a computer. Does anyone have the contact number for Vegushi shop at the Winter Village? http://wintervillage.org/shop/shop/157 There is no contact info for it on the directory and I lost a valuable there! I called all the gen. numbers for the village with no luck. Pls let me know asap. I'm leaving NY soon :( Thanks! We're so sorry to hear that you lost something! Call 212-661-6640 to get in touch with Upsilon Ventures, the market operator, who will have the contact information for that particular vendor. Alternatively, you can call the Bryant Park office at 212-768-4242 and give a description of the item; we will check with our in-park security to see if an item matching that description has been returned to our lost and found.